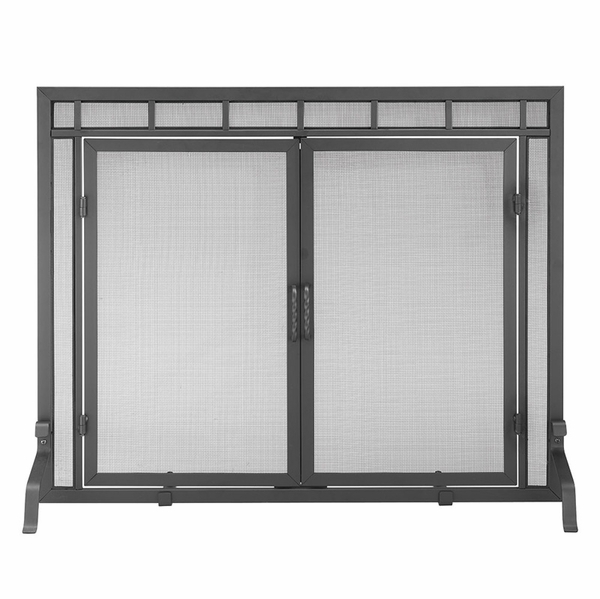 This fireplace screen features a door in the center panel of the screen giving easy access to maintain your fire. The screen and doors are framed out in fireplace black and will give your hearth an inexpensive facelift. The screen will also offer protection for your home and family from flying hot sparks, falling burning embers and dangerous flare ups. The center panel is 39 inches wide by 31 inches high. The fireplace screen is manufactured by Minuteman. Does the bottom sit up off the hearth a few inches or is it flush? Do both doors open? Is that glass in doors? Is it safe for a gas log fireplace? Both doors open and are only mesh screens without glass. This screen is safe to use with gas logs. Are the back feet at the edges, or in a little bit? The rear stabilizer feet are indeed inset by approximately 8 inches on either side. They do not project rearward from the screen assembly by much. Are there two in the back? Are they flat, or also curved like the front? If it helps, I'm looking for an extra sturdy screen that the kids can't easily topple over. This screen does indeed use a pair of rearward facing stabilization feet that are flat, offering extra support. In my experience, this style of screen is very stable and is difficult to pull over. What are the various widths for this screen? The overall width of this item is 39". The center panel width is actually 26". Well made & fits beautifully. Sets off the Arts & Crafts style of the fireplace. The customer service when I called to order this product was very impressive. The man I spoke with was quite nice and informative. Delivery was quick, and assembly was an easy process. It fits our fireplace perfectly. I was happy to discover that this screen is sturdy enough that my baby won't accidentally tip it over. It fits perfectly in the space allotted for it and was very easy to put together. Since it was so inexpensive, I was afraid that it would be of poor quality. Thankfully, my fears were unfounded. It is well constructed and looks very nice. I am quite pleased. I am extremely happy with this purchase. It exactly fits the space and is an attractive addition to the room.